As I get older I've become a great advocate of holidays with a purpose. The purpose on this occasion being wine tasting - something I can take on with due diligence. And what better place than the Alentejo region of south-central Portugal. Alentejo occupies nearly one third of Portugal and is roughly the size of the Netherlands. Once home to vast grain farms, it is now renowned for its abundance of wineries, many of which have sprung up in the last 20 years or so. It seems a tad debauched and hedonistic to start tasting wine in the morning, but that's what we did. After all, people were handing it to me and exhorting me to proffer my opinion, and I like to oblige. 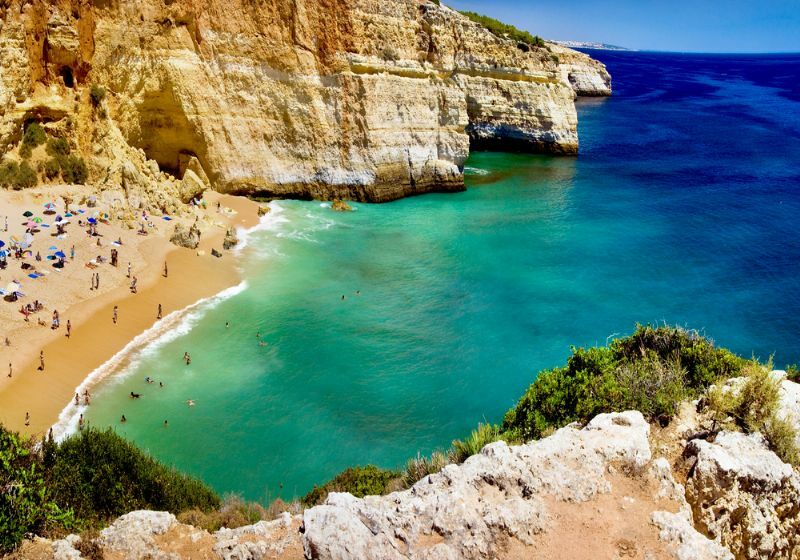 Portugal is a perfect destination for your beach holidays from Belfast and Dublin. A short flight and enless beaches with stunning hotels, its ideal for family holidays from Belfast. Our first port of call was Herdade da Malhadinha, a family run winery where traditional methods of producing are mixed with technology, and it's an oasis of tranquillity. The owner's children have designed the motifs on the wine bottles. Laughing cows, colourful fish, peacocks, sheep and much more. After a wonderful lunch, on the terrace, of tapas, huge chunks of pork fillet and "pyjamas" (various small desserts) and copious glasses of gorgeous wine, we were more than sated. Herdade dos Grous was the first stop off the next day, where again people were enthusiastically exhorting me to imbibe. More wonderful wines and lunch of tapas and cod served with onions in a divine sauce and again the pyjamas. A staple on the pyjamas medley is a mixture of sugar and egg yolks which was invented by nuns who used to starch their headgear with egg whites and ended up with more egg yolks than they knew what to do with. Herdade dos Grous, like many of the estates, is home to many animals. We spoke at length to cows, black pigs and horses. Joao, who was in the stables, was straight out of a Jilly Cooper novel - minus the whip but with the same skinny jodhpurs. He was more than happy for us to feed his charges. We were more than happy to gaze at his lovely tanned countenance. There's plenty to do in the area besides eating, drinking and gazing at handsome horsemen. Beja is a pretty city with cobbled streets in the old town. The Convento de Nossa Senhora da Conceicao, which is now a museum, was once home to a lovelorn nun whose story had us all enthralled. Back in the 17th century, Mariana Alcoforado, looked out from her window in the convent and fell in love with a French knight, the Compte de Saint Legere. We'll ignore the vow of chastity bit here, but they became lovers before he returned to France. Mariana wrote him five letters which were unanswered by the heartless cad, but they later turned up in print. They are known as the Portuguese Letters, and the window, known as Mariana's Window, has been preserved. The Castle in Beja and also the Archaeological Museum are well worth a visit, and the wonderfully traditional chocolate shop Mestre Cacau is a must. Monsaraz is a tiny medieval walled town with no less than three churches, two of which are still functioning. A walk through the cobbled streets with their sweet whitewashed houses and a stroll up to the castle was a great way to walk off some of the hedonistic fare. Herdade de Sobroso was next on the agenda. This country house, owned by the charming Sofia and Filipe Machado, is rightly described as a hidden treasure. And that's most certainly true. We tasted wines with Filipe (another candidate for a part in a Jilly Cooper novel), and enjoyed a wonderful dinner of clams with pork. Fit for nothing else but bed after another day of amazing food and wine, I retired to my suite and its four poster bed, and thought how wonderful it would be to retire to Alentejo. I could get used to these herdades very easily. The people here are so laid back they are nearly horizontal. Evora is another walled town, boasting some 20 churches, one of which is the grisly Church of Sao Francisco and its 16th century Chapel of Bones. Here, the skulls and bones of 5,000 monks decorate the interior walls. A gruesome inscription at the door translates as "our bones are here, we await yours". Charming. We had lunch in the family dining room of Herdade de San Miguel. Caldo Verde (green soup), followed by neck of pork and eggs and sugar from the nuns, surrounded by family photos of more show-jumping handsome devils out of the same Jilly Cooper novel. In fact they were practicing - "riding out" I think is the phrase - right outside the window. Our final winery was the picturesque Monte da Ravasqueira, where the owner proudly showed us their amazing collection of vintage carriages. After a lunch of lamb with onions and small potatoes and the most sublime dessert of layers of pastry with red fruits and melon, it was time to reluctantly take our leave of this wonderful area of Portugal. Our trip had proved a wonderful way to see a country. A few days in one estate, move on to another and submit to stunning rural vistas, wine and luxury. Interested in planning your holidays from Belfast to Portugal?